Unlike almost our entire holiday in the south west (of England), on the ‘Day of the Drivetrain’ the weather was glorious. Mother Earth was clearly taking the pizzle – she knew I was back at work the following day. Step one was setting up the ‘workshop’. This consisted of an old door on two plastic sawhorses. I then emptied the contents of the bike cupboard in my garage to see if there was anything useful. I got out the mini digger as well. You never know when one of those will come in handy. my copy of Zinn and the Art of Road Bike Maintenance (which you can buy on Amazon in the UK here and Amazon in the US here). In the bottom left is a really good set of hex keys (or allen keys). I got mine from Screwfix, which is my favourite shop (and will mean nothing to US viewers). 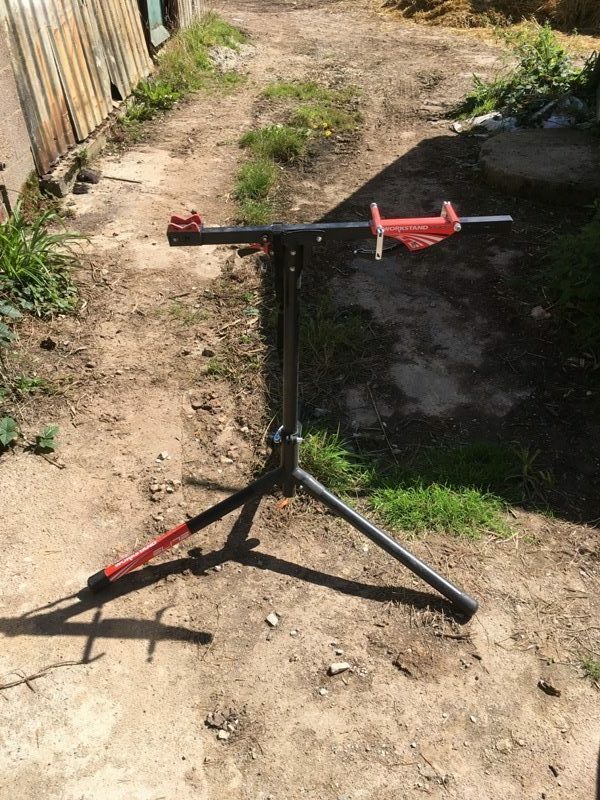 Do You Need A Workstand To Clean A Bike? 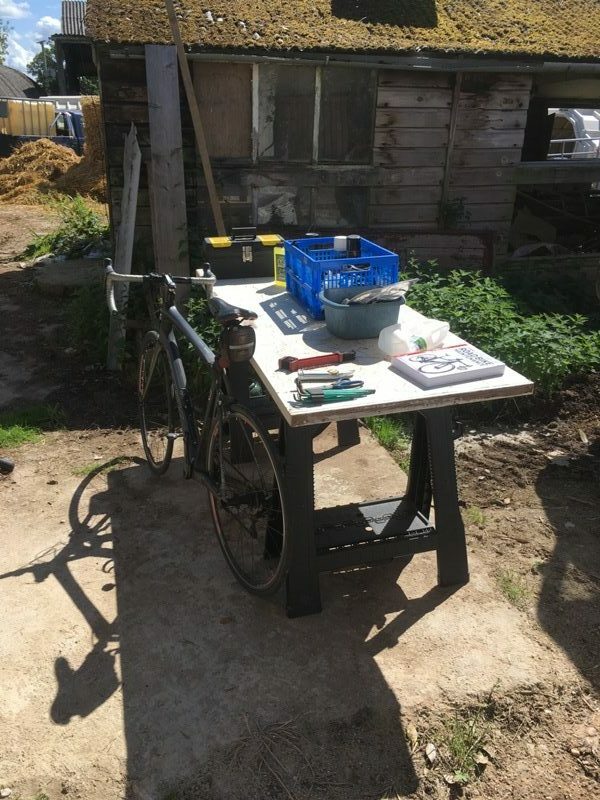 In the photo below we have my bike workstand, which is made by Elite (or Elite Elastogel Turbo Trainer fame…). If you don’t already have a workstand, I would recommend investing in one. It makes working on the bike significantly easier. Fiddly tasks are conducted at a height where you don’t have to bend down. You can spin the pedals and change gears without simultaneously (somehow) lifting the back wheel off the floor to allow it to turn. 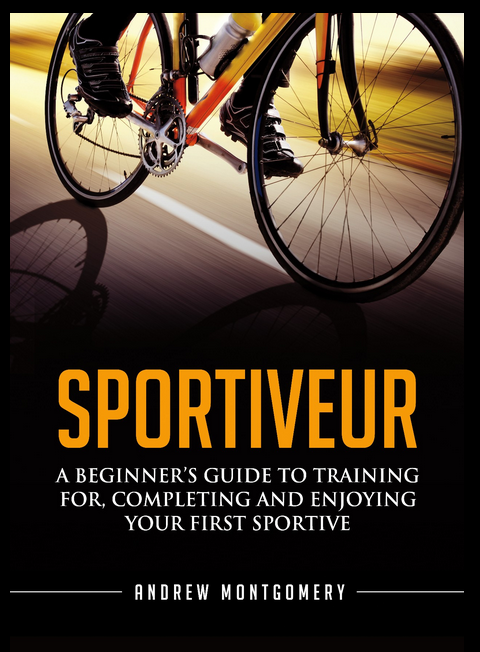 You can also spin the bike around in a pleasingly professional manner in order to work on (or clean) different parts of it, whilst you yourself remain in one (pleasingly professional) position. It seems I chose another part of the building site (our home) on that day. Okay, moving on. Next step was to remove the chain. It turns out that once you have a bit of grime on and in it, a quick link ain’t quite so quick to qu-emove. You have to sort of push it together, whilst squeezing the middle, in order to disengage the pins and slide it apart (yes, I know, you’re none the wiser). 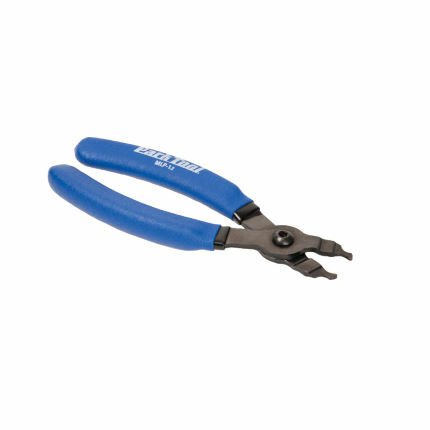 (Which is a set of Park Tool Master Link Pliers). Unfortunately, being a general tool myself, I didn’t have the specific tool. So I resorted to Youtube for solutions. I tried a few of the options, including one involving string (in the absence of spare brake cable) where you try and pull the link apart (I couldn’t get purchase). Having used a set of non-specific pliers and just about avoid causing irreparable damage to the quick link, the chain came apart. In the photo below you can see the two bits that make up a quick link. (Remember this image above – I’ll refer to it again in just a moment). With the chain off the bike, it went straight in a bath of degreaser. Lucky chain. How about that (now) for a fine array of degreasing and regreasing product? 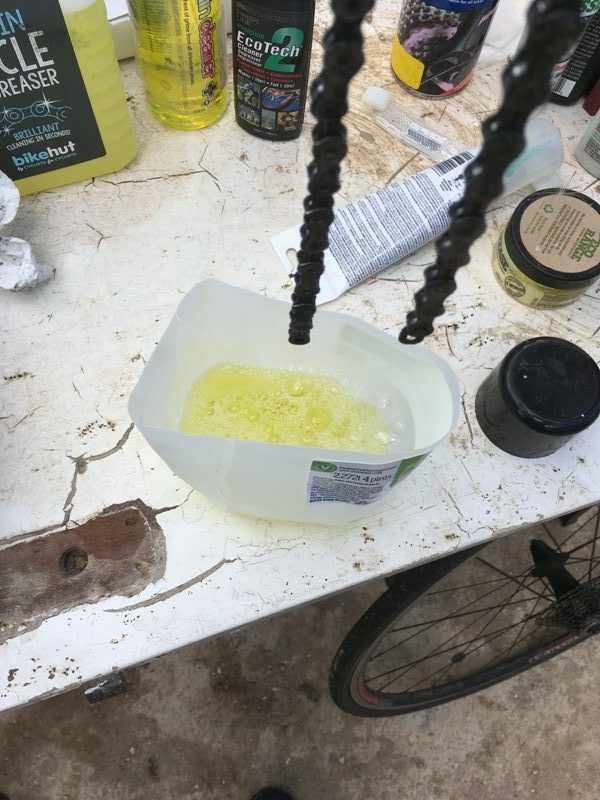 The degreaser in the bottom half of a milk container (I told you it would come in handy) is made by bikehut (of Halfords and Cycle Republic fame, if you’re in the UK) and comes in a rather fine shade of ‘slightly dehydrated urine’. It would appear that the greasy gunk on my chain was more than a match for the yellow dye in the degreaser. Or perhaps the degreaser was more than a match for the gunk, in that it seems to have removed a job lot of it. Now, recall that photo of me holding the chain, showing the two halves of the quick link. Well, interesting story (yeah, right). 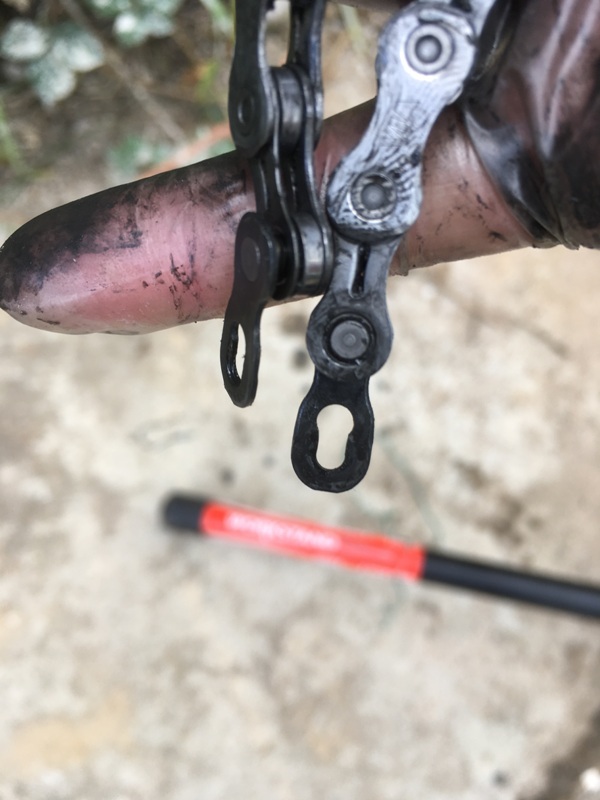 Between that photo and the one of me dangling the chain above the unused degreaser, you will note that one half of the quick link had gone AWOL. Which I only noticed some considerable period later, when I’d taken the chain out of the degreaser, wiped it down and left it to dry. Cue 20 minutes of scrabbling around in the dirt, trying to calculate (using maths, physics and druidism) where I might have flicked the ickle linkle. Happy bunny I was not. Amazingly, given the less-than-clear “workshop” floor conditions, I eventually found it (and gave it a damn good thrashing degreasing). Right, moving on. With the chain out of the way, I decided to take apart the rear derailleur. Because why the hull not? 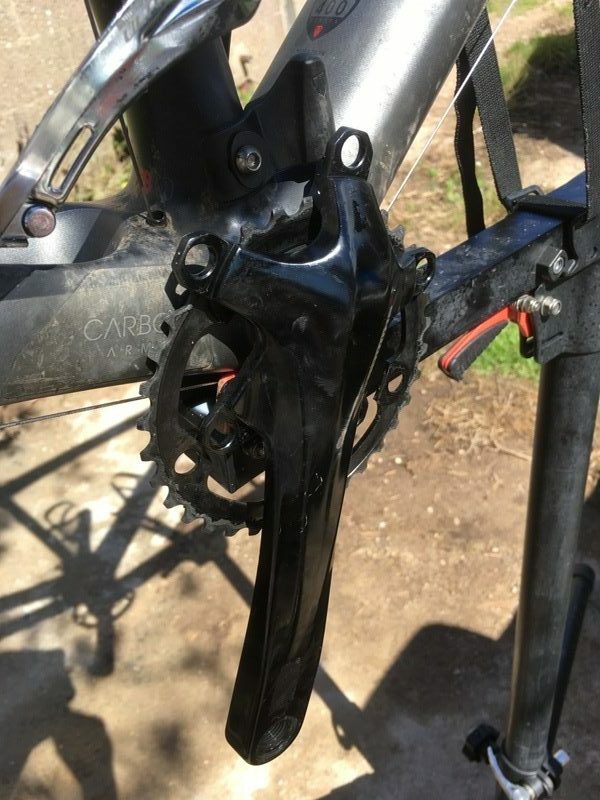 Actually, the main dirty bits of the rear derailleur were the two jockey wheels, and whatever that metal brackety thing is that holds them in place (perhaps the ‘cage’?). So that’s where I focused my dismantling efforts. In addition to allowing me to share (vital) images of my endeavours with you good blog readers, taking photos of the various parts in situ (or close to situ) were an attempt to record visually how to put the bally thing back together again. As I publish these images, I’m starting to get somewhat embarrassed at the state I allowed my drivetrain to get into. 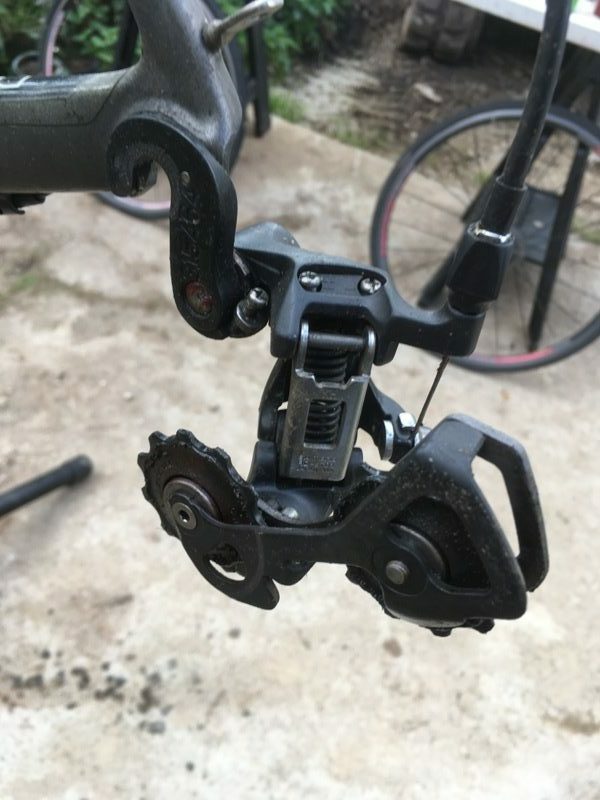 Anyway, for completeness, the photo below shows what the rear derailleur looked like with both jockey wheels removed, as well as the ‘brackety thing’. 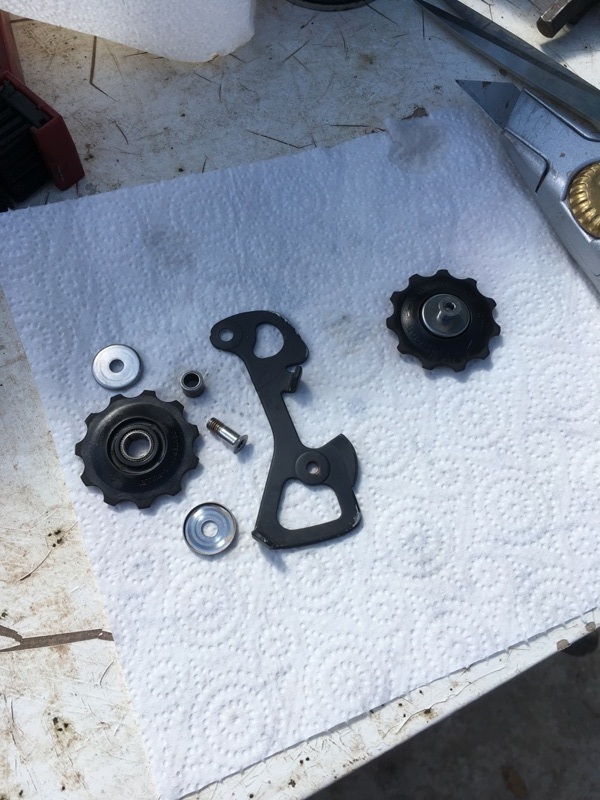 With the jockey wheels out of the way, I was able to get in and clean the inner workings of the derailleur when I gave the bike frame a wash. The removed bits of the derailleur got a go in the degreaser bath before receiving a thorough wiping. I was a bit surprised at how plasticky the jockey wheels were (for they are made of plastic) and how unsophisticated the whole ‘bolt and bushing’ arrangement was. 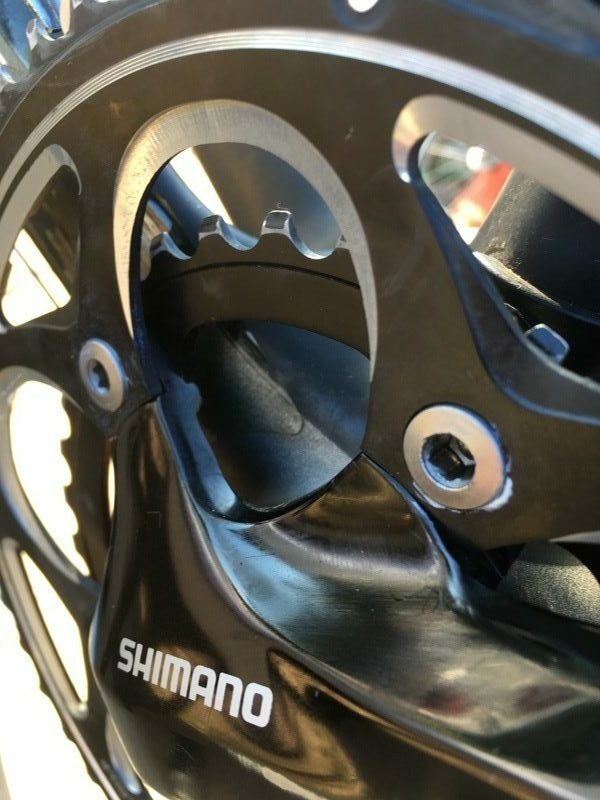 I immediately ‘hit up’ Google to see if it was worthwhile upgrading to jockey wheels with bearings in them (similar to wheel hubs), ideally in some shade of your blingiest anodised aluminium. 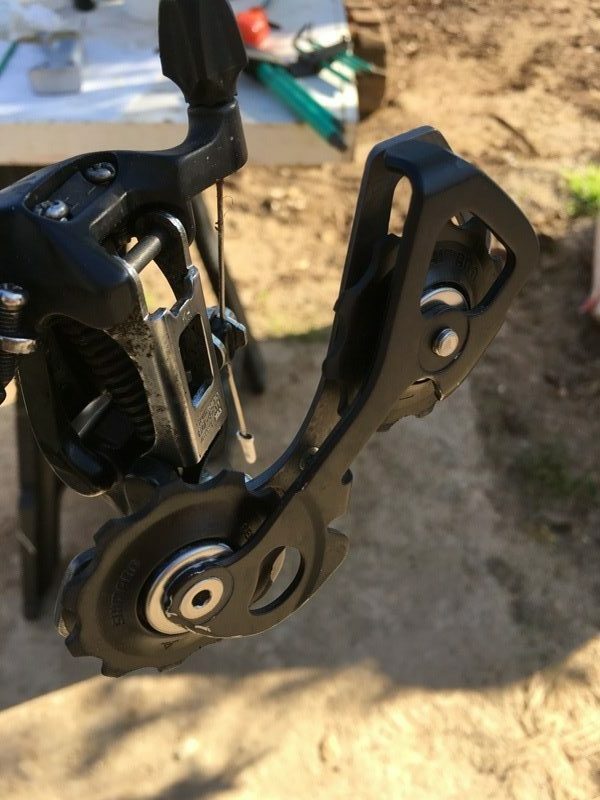 Anyway, behold what a reasonably clean rear derailleur looks like. Also behold some proof that I was able to put it back together (turned out not to be too difficult). I even put a little grease on the threads of the bolts before screwing them into place (ooh, get me). 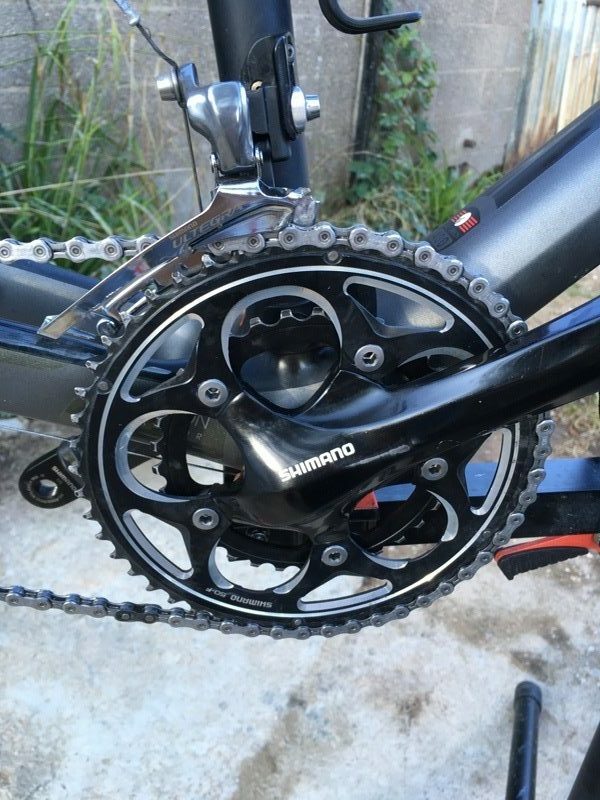 And so we turn to the chainrings. 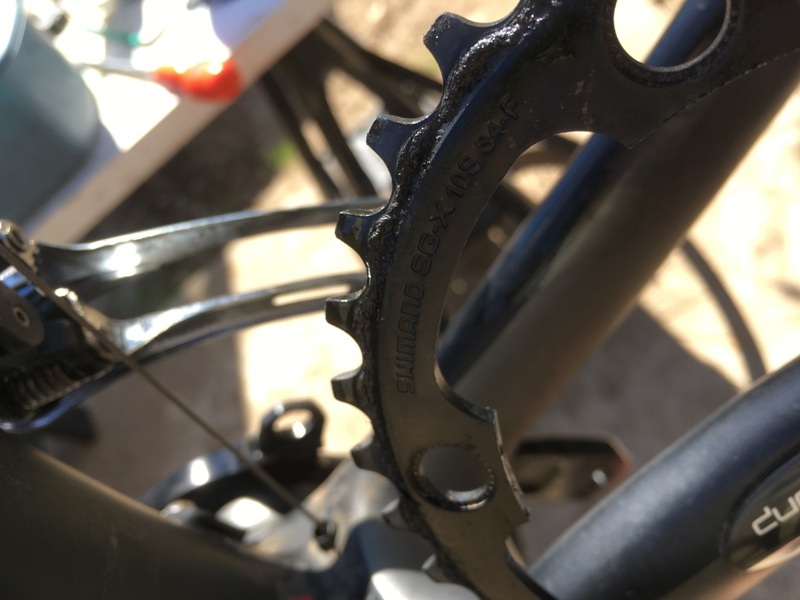 From the image below, you can (rightly) surmise that I took off the large chainring before remembering to take a photo. 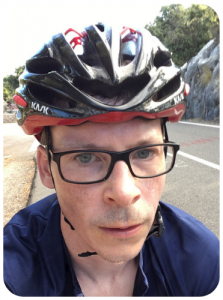 Still, all was not lost, it turns out their were two chainrings on my bike (though I, of course, only operate in the ‘big ring’). 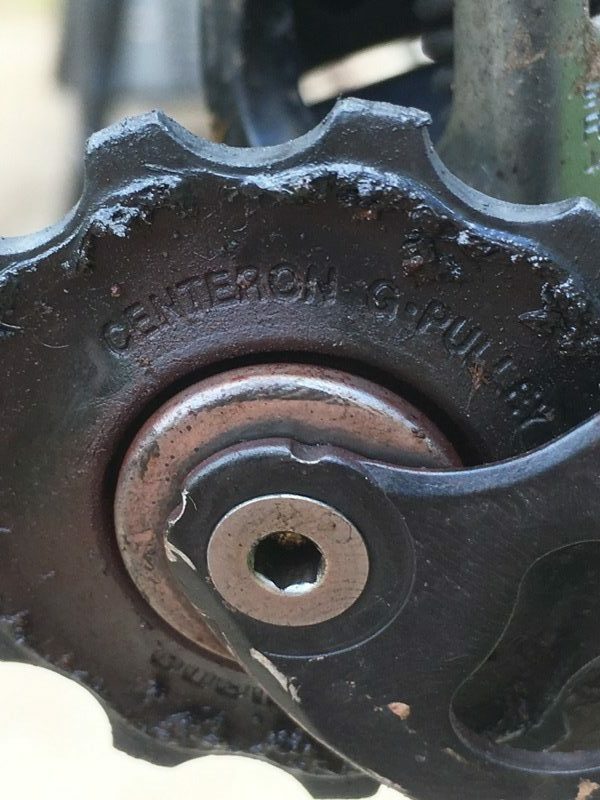 Continuing the embarrassingly grimey theme, it appears my chain rings were in competition with the rear derailleur jockey wheels to see how much gunk they could hide about their person (or actually in plain sight). So, with the chain rings off, I’d exhausted the list of items I was comfortable taking off the bike frame that I was also (reasonably) confident I could reattach. I couldn’t see a particular need to remove either of the derailleurs entirely, and I didn’t plan to touch the brakes. These could all wait for a later date (when perhaps I’d accrued a little more mechanical acumen). Reattaching the chain rings. Turned out to be pretty straightforward. I put some grease on the threads of each of the bolts because, you know, that’s what us pro mechanics like to do. Interestingly (or not), after claiming to have given the frame a ‘good clean’, I can see a bit of dried on mud at the bottom of what I think is the seat post. Still, it looks pretty shiney in this shot, right? 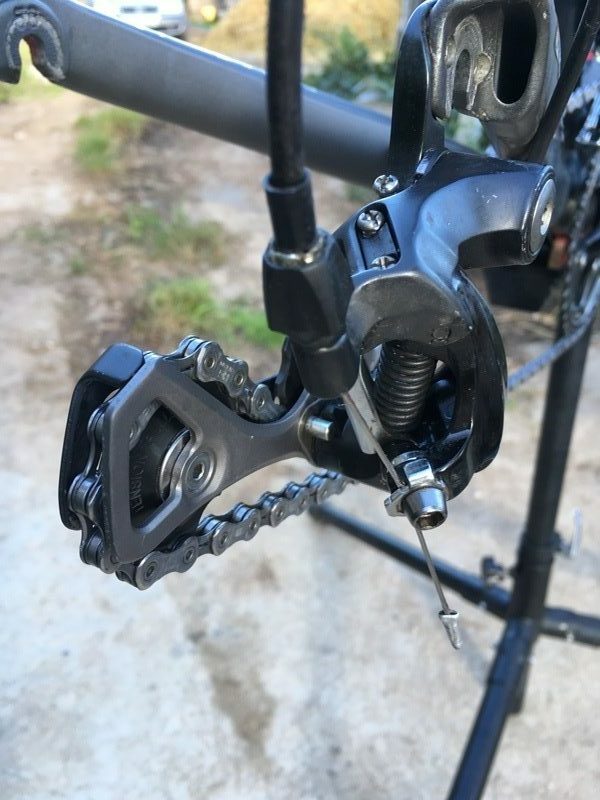 It took me a disturbingly long time to work out how to re-thread the chain around the jockey wheels of the rear derailleur. 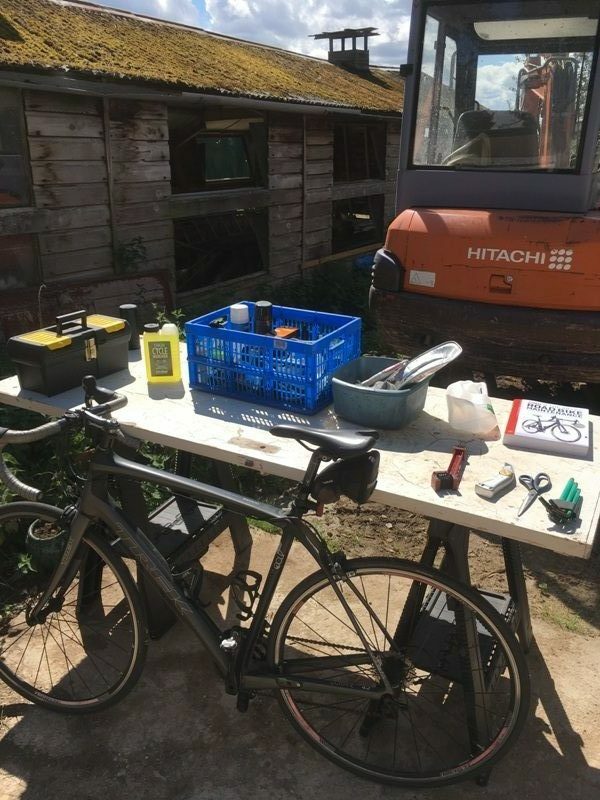 It’s almost as if I’d never seen a bike before… In the end I went ‘old school’ and consulted my Zinn and the Art of Road Bike Maintenance book, rather than resorting to Youtube. Once I managed it (reattaching the chain) I took a number of photos, just to savour the moment (and to record for posterity the one time in 2017 when my bike was really clean…). In the photo below, the eagle-eyed amongst you might note the front derailleur is Ultegra, whereas the rest of the gears (and the brakes) are 105 (and old-fashioned ‘5700’ 10-speed 105 at that). 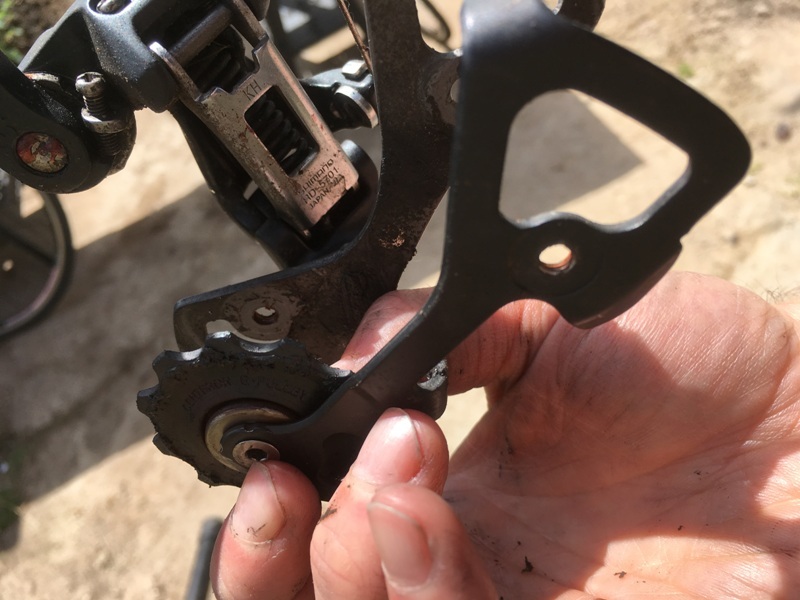 The elephant-memoried may recall that I upgraded the front derailleur when I managed to knacker the 105 version in the middle of last year (the goldfish amongst you can refresh your memories by reading my exciting post on the subject). I’m pleased to report that the Ultegra front derailleur is still in good nick (it certainly doesn’t have the same scuffage as the 105 kit). … And lo, the day of bike cleaning became a long one. And it was good. And long. So I won’t bore you with too many more details. I cleaned the wheels, including degreasing and scrubbing out gunk from the cassette. I must admit that I didn’t take the cassette apart though. I just got down and dirty with a brush (formerly resident in our kitchen sink). Maybe we’ll save deep-cleaning the cassette for another post (ooh, the anticipation…). 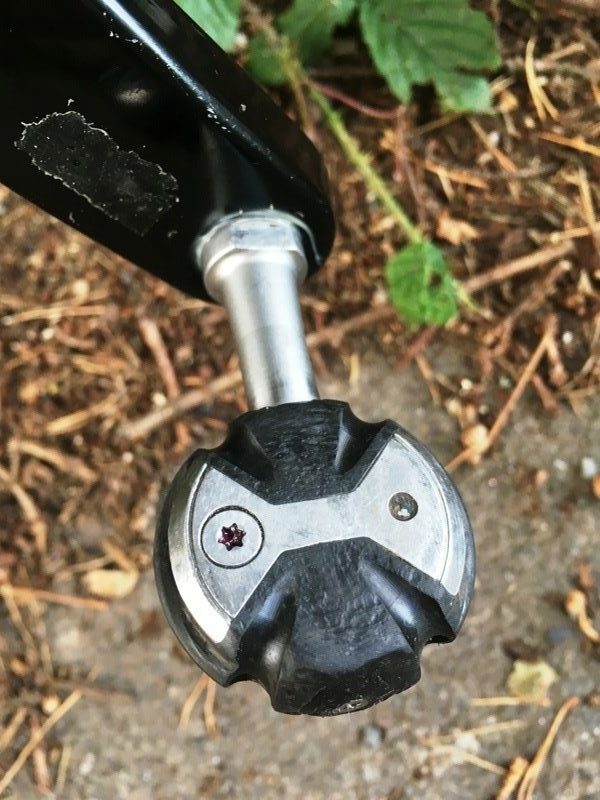 Meanwhile, I’ve dealt with removing and replacing the grease inside Speedplay pedals before, so I won’t go over old ground. For the avoidance of doubt though, I squeezed in some clean fresh grease (into the pedals) and squeezed out some ol’ dirty brown muck. So to speak. 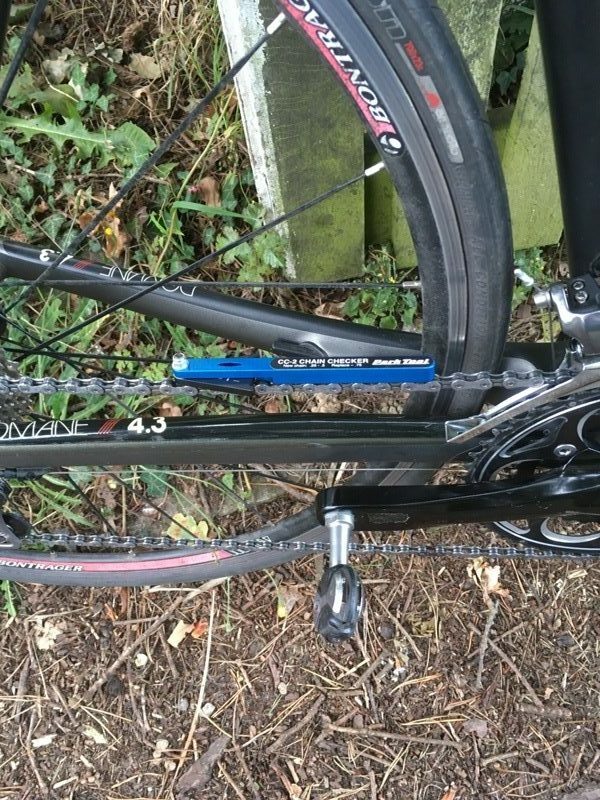 A sensible person would have checked for chain wear before embarking on hours of cleaning. I decided to do it after removing the chain, cleaning the chain and reattaching the chain. As to my level of sense, you can draw your own conclusions. It was actually quite exciting (I live a closeted existence). I haven’t used my chain measuring tool much (it’s this one from Park Tool – yes, Park Tool again…). 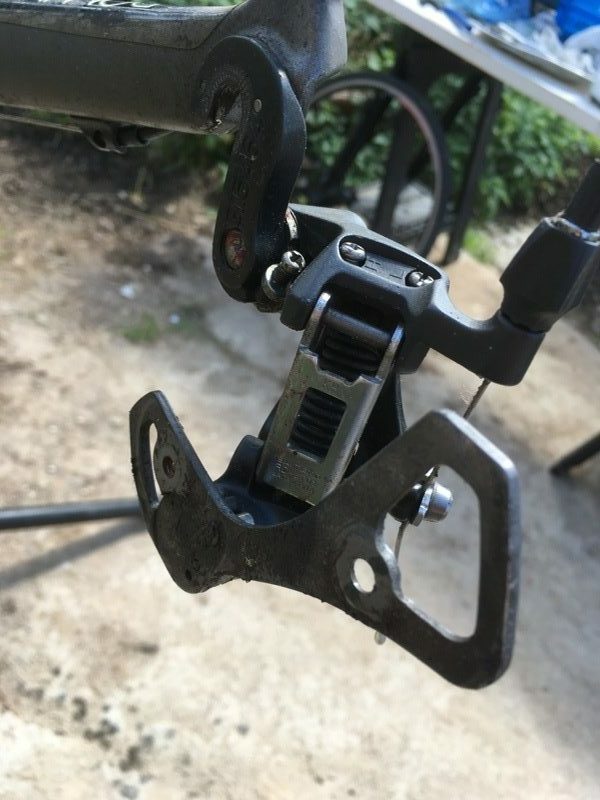 Essentially you stick one pin betwixt two outer plates – where the chain is wider – and the other movable pin into another chain link made with inner plates. You then push the V-shaped black lever until it stops and see what number can be seen through the little window to the scale beneath. The reading of 0.25 (which I think means it is subject to 0.25% of wear) means that the chain is still usable. The time spent cleaning it wasn’t wasted! 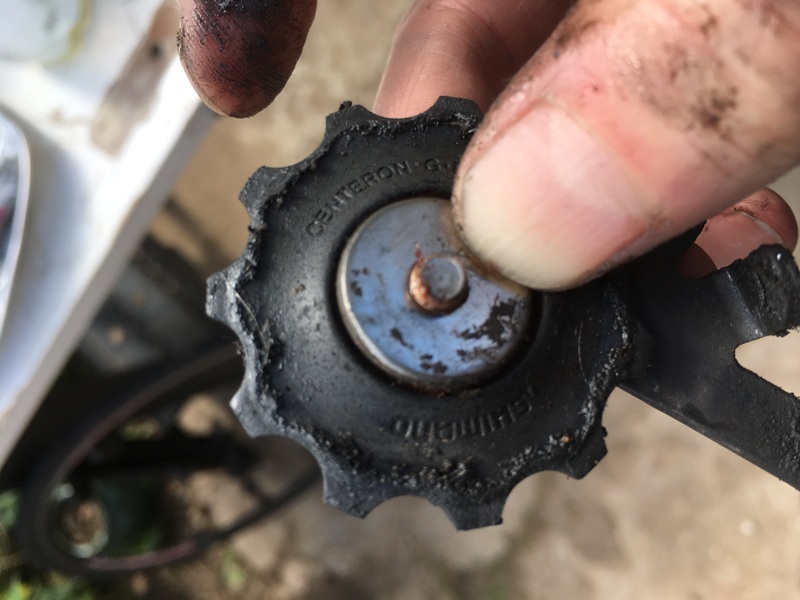 For my 10-speed chain, if the checker had read 0.75%, I’d be in the market for a new chain (11-speeders would need to think about a new chain at 0.5%). Incidentally, bike chains don’t actually stretch. It’s a misnomer. Just thought I’d throw that out there (without any further explanation…). 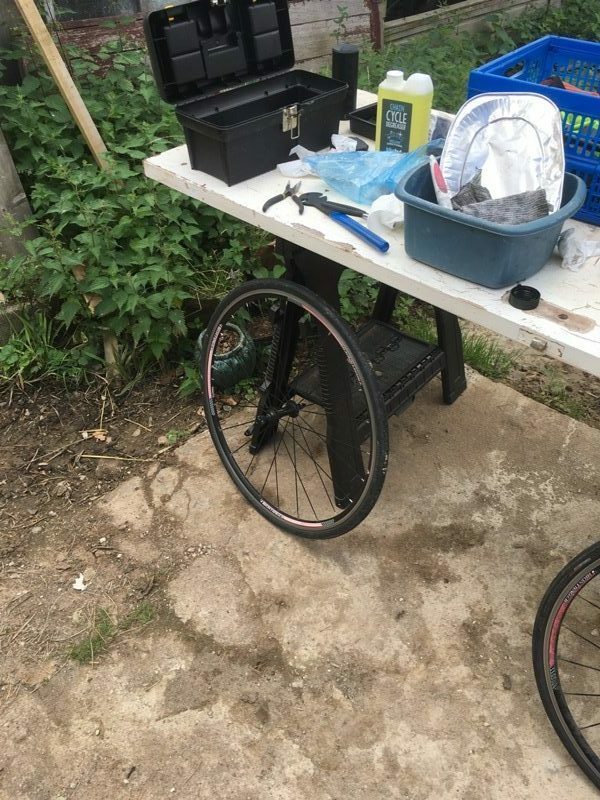 If you don’t tend to take your bike apart in order to clean it, I hope this post has given you a little confidence that even the somewhat mechanically-inept are capable of doing it (and reassembling it afterwards). The more experienced amongst you can laugh and point at all the mistakes I (unknowingly) made. So, do you clean your bike on a regular basis? Do you find the process meditative or frustrating? Do you have any good tips to share? Let me know in the comments below. Can I be so bold as to recommend the Park Tools Cyclone chain cleaner (other brands may be available)? I don’t have a split link chain, but I can completely clean my chain and re-oil it in about 10-15 mins with one of these, and they’re not dear. 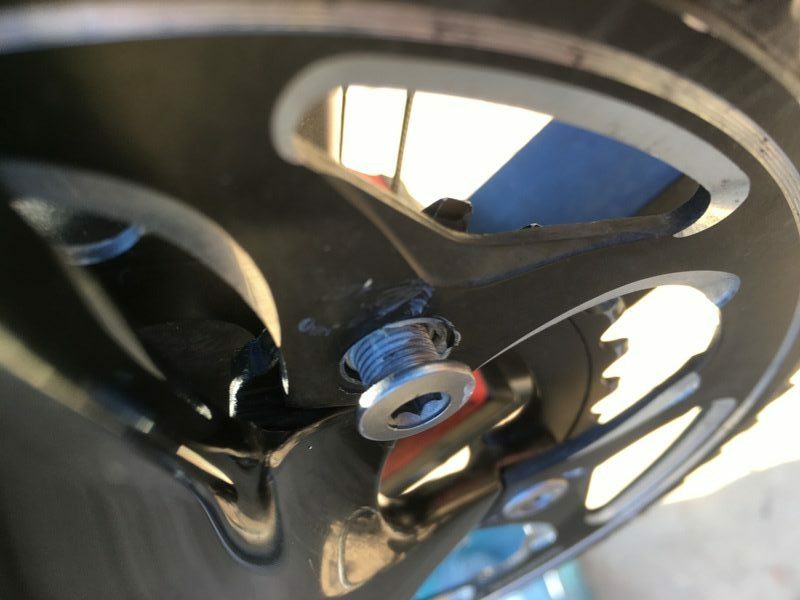 If you get a dummy hub too you can do it with the back wheel off – bike on a stand of course – and have a wee scrub of the derailleur and back sprockets at the same time. 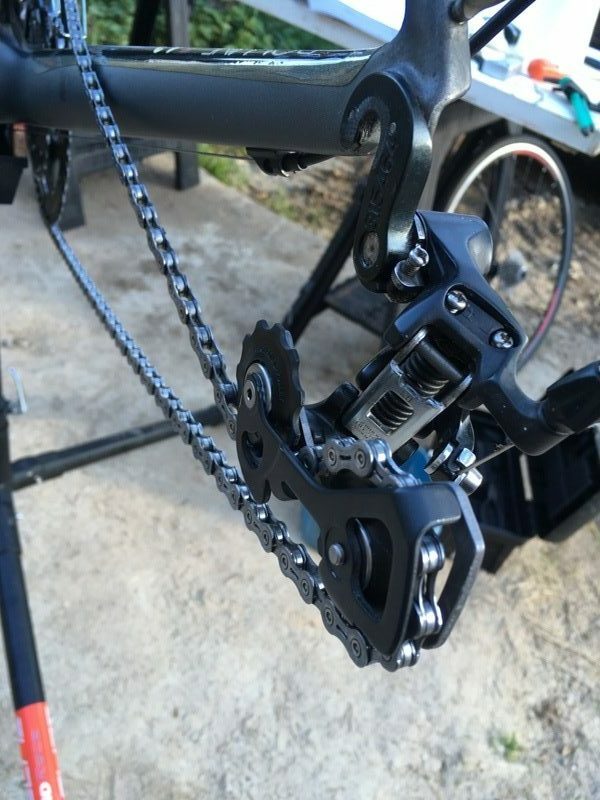 Every few weeks I clean my chain with car wash soap and hot water, using a chain cleaning tool. I spray the bike gently with hot water, then spray the chain with earth friendly chain cleaning spray. 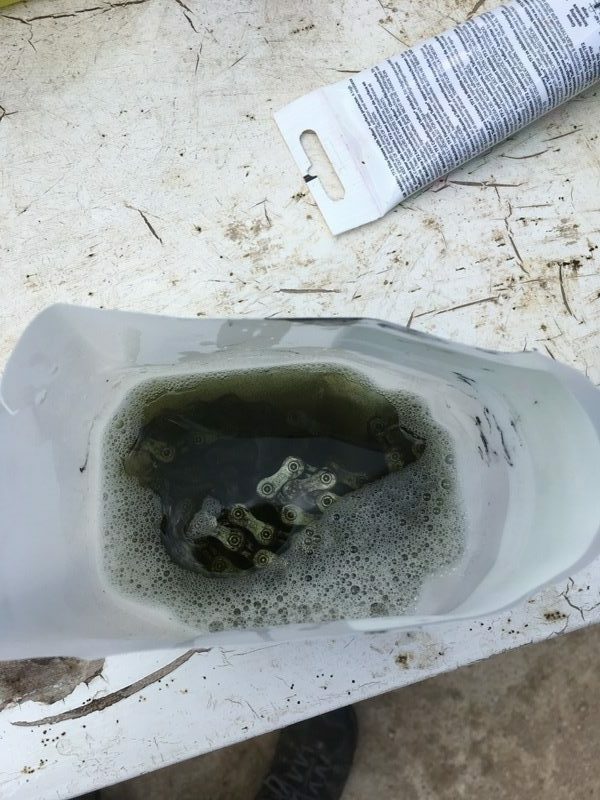 I fill the chain cleaner with hot soapy water, and run the chain through it repeatedly. Then I go to work with my Park bike cleaning brushes, working from the top down. Finally, I rinse it and let it dry. Before the next ride, I lube my chain and wipe the outside of the chain with a clean rag. My bike stays clean this way, and the deep cleaning you’ve described is needed only once a year. That’s for a bike that gets ~ 3,000 km per year. But I ride in winter with full fenders – a must in my rainy climate. 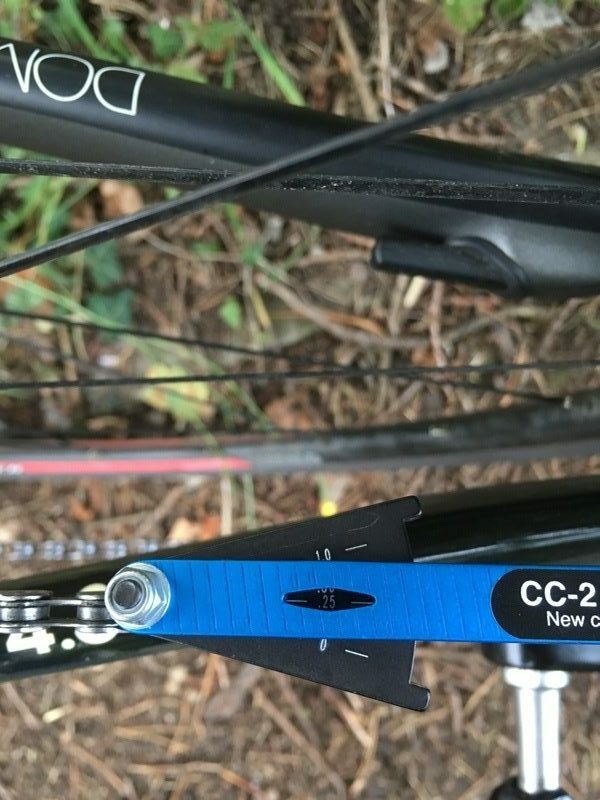 All good but echo Chris Stoddart above – park tool cyclone chain cleaner, clean and re-oil. After wet rides clean bike thoroughly and use wet lube immediately. Dry lube other times. Use non-fraying rag to clean cassette just rub rag side to side inbetween. 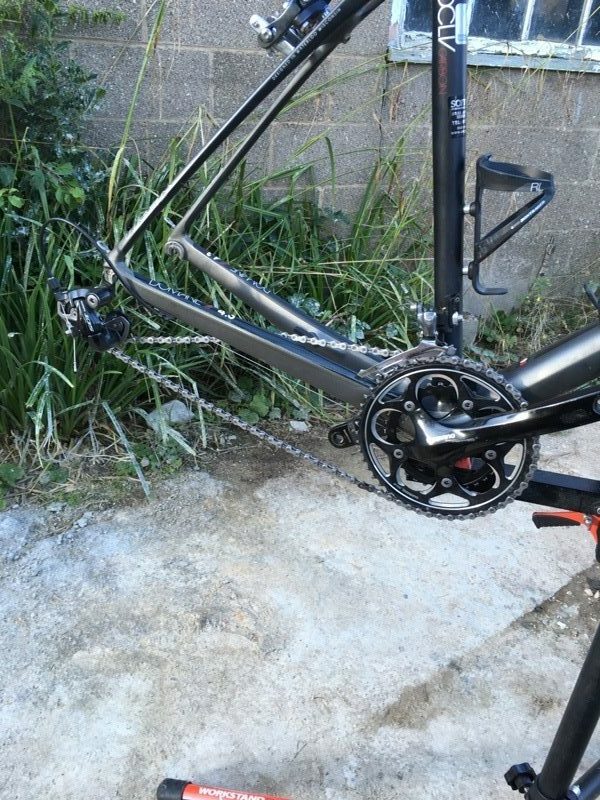 Jockey, front derailleur and chain rings just need rag clean – TLC after a long ride. Sure you can do more but my 105 set is still looking and performing well after 5 years of a simple routine – even got a compliment last Sunday on how clean groupset was and really I just spend 10-15 mins a week or every 2 weeks cleaning it. Great blog – find it motivational. Wow — impressive cleaning job, Monty! 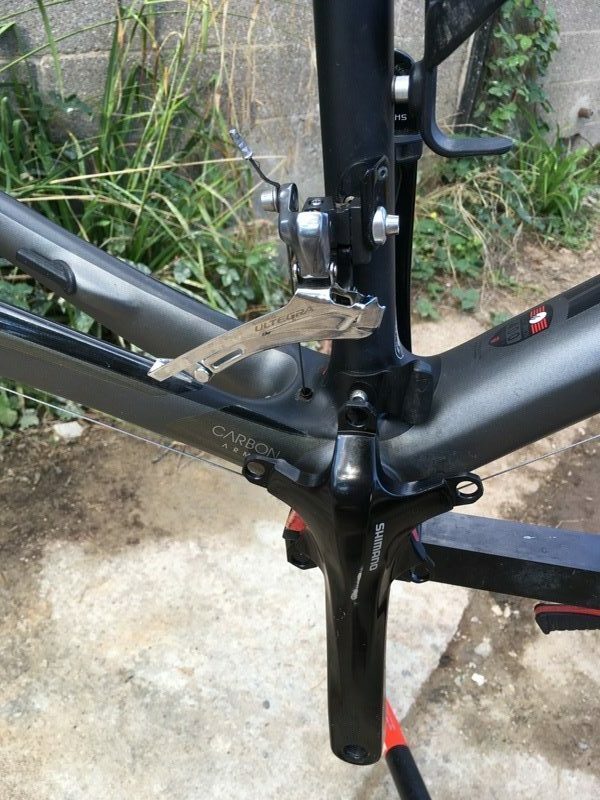 I’ve had my current bike (a Trek Madone) almost three years, and never yet taken off a chain, disassembled the rear derailleur, or removed the chain rings. I do wash my saddle and wipe down the frame after every ride, and I wash the bike every week or two (or three, or sometimes four :). 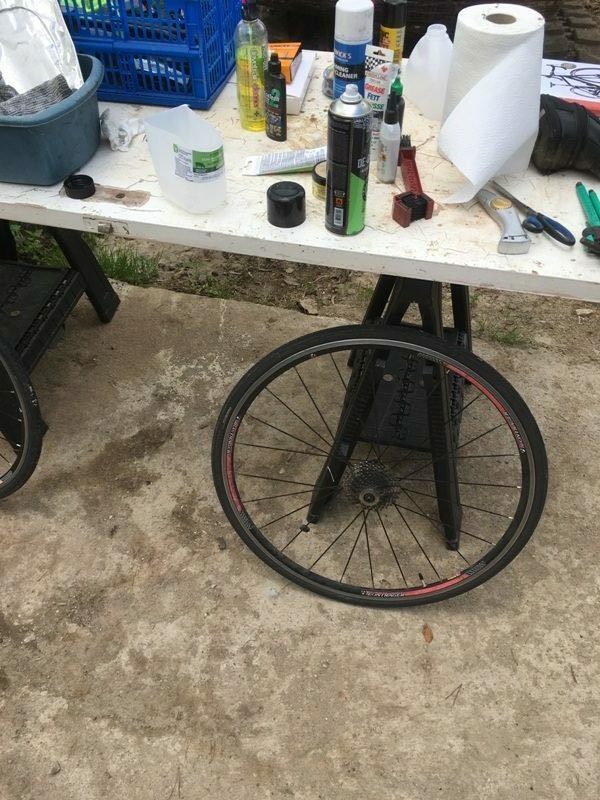 I follow Simon’s quick-wash method on GCN (except for the WD40) — rinse the bike, degrease the chain and drive train, remove the wheels, wash the frame and wheels, then reassemble, dry, and relube. Furniture polish on the frame afterwards keeps it shiny. I ride about 13,000 miles a year and my bike is still looking pretty good. And that’s the way I like to ride it!